I’ve used the WPML WordPress multilingual plugin on a number of sites I’ve built for clients. It is such an extensive plugin that I have not used every one of its features – for example I’ve not used it on a Woo Commerce site. So what follows is a combination of my own experience of using the plugin on the multilingual sites I’ve built, along with results of the research into areas of the plugin that I have not used in the past. It starts with what, to my mind, is the defining factor of a multilingual plugin: the quality of the translations. If you’re running a multilingual website the quality of the translations is, in almost all cases, supremely important. It would be the defining factor, at least for me, in the choice of translation tools. After all, if I come across a site where the English version is poor, I quickly give up and move on to another site. I simply cannot be bothered to do the extra work of trying to understand poorly translated content. Those sites, therefore, lost a visitor and, potentially, some business. This turns the quality of translations into a highly important factor if you are to maximise the benefits of a multilingual site. Good quality translations will improve the time-on-site factor and conversion rate for visitors in all languages, not just the site’s base language. For me, as a developer, hot on the heels of the quality-of-translation factor comes the efficiency with which I can implement those translations. And in both of those factors WPML performs better than the alternatives with which I’m familiar. WPML is the only multilingual WordPress plugin that, to my knowledge, offers both types. The machine translation feature, which greatly improves the efficiency with which pages can be translated, was introduced in WPML 4.0 with the Advanced Translation Editor (ATE). The ATE has a machine translation tab through which you can automatically translate existing pages into one of the 40 available auto-translate languages. Once the machine translation is complete you can review it for quality, correct spelling mistakes and provide better translations of specific words. These edits will then be incorporated into the translation and onto the published page. While the machine translation option makes translations quick and efficient to produce, and leads to good quality translations, I prefer to use the manual-, or self- translation option. The beauty of the self-translation option is that it doesn’t matter whether or not there’s a machine translation language available – you can translate any language at all. And, most importantly, you can incorporate local nuances and edit the message (e.g. refer to local landmarks) to make translations fully relevant to local visitors. This makes for a better connection with foreign language visitors, which will help to extend time-on-site and improve conversion rates. As soon as it’s activated, WPML analyses the pages and posts on your website, links each with a duplicate that needs to be translated and indicates the status of the translation. Clicking the ‘+’ sign takes you to a copy of the current page, enabling you to translate it paragraph by paragraph. When I’m doing this for clients, I ask them to provide the translation they want, paragraph by paragraph, with the translated paragraph just below its English equivalent. I then copy and paste the translated paragraphs into the page-to-be-translated without disturbing any of the HTML or media elements. Given that I’m usually translating English to Chinese (which I cannot read) this is the most effective way of ensuring the translation is exactly as the client wants it, while leaving the page layout undisturbed. The result is a site that has the best possible message for visitors in any of the languages the site offers. If you’re building a site for a client who will take over and manage it, the translation management option will make their job much easier. This makes the process of managing translations of multiple pages, in a busy, multilanguage site, as easy and efficient as possible for the Translation Manager. The string translation module analyses all the plugins and themes on your site and lists the automatically generated text strings. These can be filtered by plugin or theme (called domains) or you can search the entire list. The ‘Back to Catalog’ text string, which is referred to in the image above, is generated by the Product Catalogue plugin when a visitor is viewing the product details page. It’s a link that takes them back to the catalogue view. In this way, all the text strings (or automated messages) that are generated by the plugins on your site are translated into the languages your site offers. The menu synchronisation feature is unique to WPML and one of the features I could not do without. This is because, living in Hong Kong, most of the translations I need to do are from English to Chinese. And since I have no idea how to read Chinese characters, synchronising the menu labels would be nearly impossible..! Thankfully, WPML takes care of that for me at, literally, the click of a button. This ensures that the Chinese and English menu tabs line up in the same order and, even more importantly, that the sub-menu items in drop-down menus are under the correct parent. In many cases a multilingual website has editors and contributors of different nationalities in different countries. For example, one of my clients has Chinese users and editors living in China and English-speaking users and editors in Hong Kong. In this case, having a translation of the WordPress admin area in simplified Chinese has greatly eased the burden on the Chinese based editors when adding or editing content on the site. While WordPress has had the option for users to select their preferred language for the admin area – i.e. the language in which labels and titles are displaid – for some time, WPML adds the ability for users to edit in their preferred language, or the language used on the front of the site. This is particularly useful for RTL (Right-to-Left) language users, who would want to be able to edit content in the same direction as that in which it’s written. WPML has a branch called Woo Commerce Multilingual, that enables Woo Commerce sites to handle multiple languages, multiple currencies and different media options by language. These functions are extensions to the base WPML plugin. This approach is taken in order to ensure that users only have the functionality (and, therefore, code) that they need, rather than being saddled with a lot of unnecessary and unutilised code. With these addons you can translate everything that Woo Commerce offers: products, variations, categories, fields and attributes with different prices and different currencies for different locations and languages. Woo Commerce is highly flexible, offering all the eCommerce options that an online shop would need. When this is combined with versions in multiple languages, multiple currencies and different media options, the configuration and setup becomes even more so. 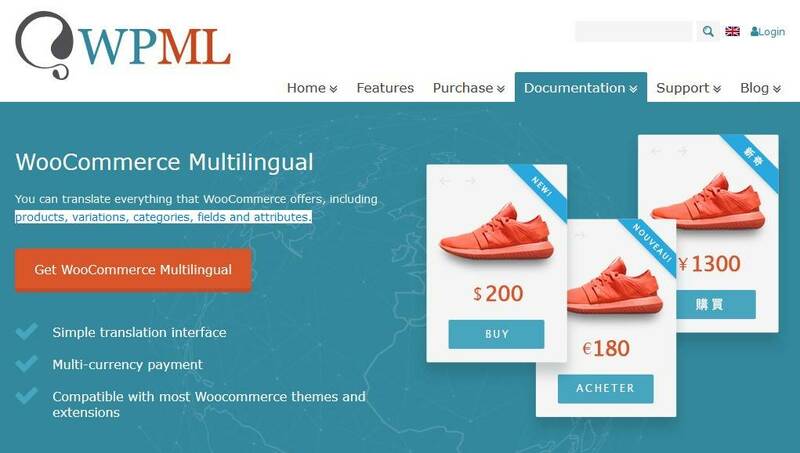 As a result, there is extensive documentation available on the WPML website to guide you through setting up Woo Commerce Multilingual successfully. As always, the support offered by any of the products I use has to be top notch. I’m providing an excellent level of service to my customers and I have, therefore, to be confident of an excellent level of support from developers of the tools I use. I’m happy to report that the support from the WPML team has consistently met my needs and more. This includes, in two cases that I can recall, liaising with a plugin developer and my design framework provider to resolve problems and make for a smoother, more reliable integration with WPML going forward. WPML is, obviously, a complex and extensive plugin. The range of translation options and the way it can enhance your SEO make it so. As a result, the level of support needs to be great – and it is. The downside of the extensive range of functionality that WPML offers is that there is a small number of themes with which it may not work properly. These, generally, are themes that do not fully comply with the WordPress standards. To be clear, WPML will work with any theme (and plugin) that makes use of the WordPress API. If the theme you’re using is from the WordPress repository or one of the reputable theme stores (Theme Forest, StudioPress, or similar) then there will be no problems but, if it’s not, then it would be worth checking on its compatibility with WPML before you buy. Overall, I have found WPML to be a pleasure to work with. It is intuitive, the documentation is extensive and clear, and the support has been absolutely excellent. If you’re looking for a multiple language plugin that offers the ability to create excellent quality translations, efficient time management and to incorporate intuitive tools which greatly eases the process of managing a team of translators, then you should look seriously at WPML. Great product, I have always been amazed at these types of systems that have the ability to translate. To have a program which translates along with translation management of human translators seems to be a great tool to invest in! Yes – it is a great product and an essential if you’re looking for good quality translations. The advantage of using human translations is that they can incorporate local nuances that would strike a chord with local language speakers, rather than just being a grammatically accurate translation of the original text. It makes it easier to ‘connect’ with your second language visitors. Thank you for this comprehensive review of the WPML plugin. Despite the complexity of the product, you have clearly described its various functions and capabilities and, as a result, I feel I have a full understanding of what it can do and how it could potentially help my business. The fact that the plugin offers the two translation methods is a significant benefit. For now, the auto-translate is all I really need but the ability to switch to self-translate in the future is a huge bonus. As with you, support is always a critical factor in my decision to purchase any product and your experience in this area seems to indicate that won’t be an issue in this case. Yes – I use this plugin by default on all multi-lingual sites that I build. A feature that I particularly like (because most of the translations I set up are in Chinese, which I cannot read) is the ‘Menu Synchronisation’ feature. What this means is that once you’ve set up all your second-language pages the plugin will analyse your menus, highlight pages that are in one menu but not the other, enable you to make decisions as to whether or not the highlighted pages should be added and then order them in the same way in both languages. When you’re building sites with anything more than a basic menu, in languages that you cannot read, this is a god-send..!